Gorgeous, Denise!! LOVE the first outfit on you. Oh, and guess what? You look amazing (and not age inappropriate in my books) in ALL of these. Love the red tee on you, too. And all your footwear. I was all set to say that Okalas didn't quite fit the Rick Owens look, but then I looked at the photo and I like it. They add some refined contrast to the clothes. I do love that Rick Owens color. Is that the Okala color that Angie was searching high and low for? I vote keep. And I really like all your outfits! Omg, love everything. The Okala are perfect! Adore both casual outfits. The shorts are fab on you. I know your climate and these are perfectly appropriate. You have great legs! The colour of the okalas looks really good with the skirt and top. Looks good with your skin tone too. Better than black, I'd say. I like the Okalas with the skirt. Oh, and your shorts outfit looks just fine to me! You look great. The Okalas are perfect with the skirt outfit (which is fantastic on you). I love the red top and jeans outfit too and the shorts which are perfectly age appropriate in my book. Oh my goodness, Denise, while I love all three outfits 1 & 2 are stunners. You have such great shoes, and I like your white pedicure. FWIW, Bon Ton has the burgundy suede Okalas online in 7.5 only for under $50. I think this is all fab! And don't even talk about age inappropriate- you look amazing. Although my fave is the red top outfit because it's outside! I like the Okala's with the outfit, I think a really good match and sure they will be useful with other pieces too. Also like the other two looks a lot. Those silver sandals are great! And shorts are just fine, in fact a crime not to wear in the heat. I love the Rick Owens skirt outfit both ways! I think the Okalas complement the outfit really well. I would keep if you think you'll wear them with other outfits, too. The color of the skirt looks like something I would wear (well, I'd like to have the skirt itself, come to think of it! ), and I would pair it with stone. I've found a surprising amount of stone colored leather with an olive cast to it. Maybe keep an eye out for something like that. All of the outfits are great, Denise. 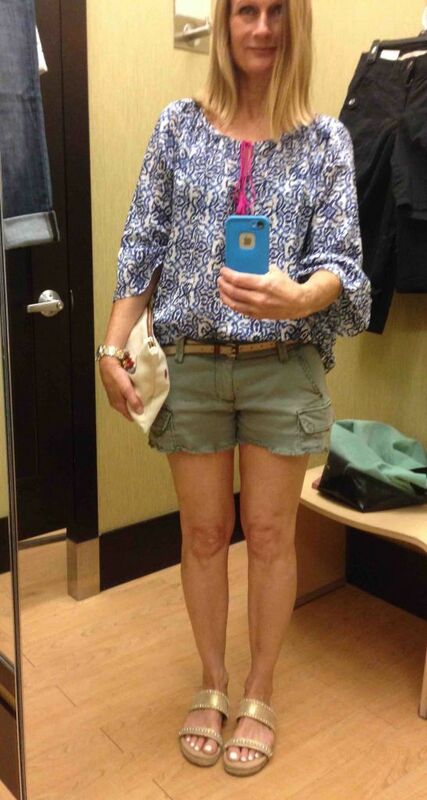 The shorts outfit is so terrific on you, don't worry about age. The first outfit is sophistication at its best on you, and you can also carry off the bit of boho of the last one, too. Love the whole lot! The Okalas look super, I wouldn't worry about the color; they're unique so will be a bit trend-proof. Totally adore the sandals in #2, if you ever find a suitable replacement I'd love to know what they are so I can also get a pair! #3 and 4 are perfectly casual cool looks, and I'd be happy to wear them both. Also really like how the belt dresses up the uber casual shorts (which you totally rock). You look amazing in those Okalas! Love the outfit! I will bow to the YLF wisdom that the colours work. All of it works extremely well for you. When you described the green Rick Owens I didn't imagine the Okala shoes would work, but I think they bring something special to the look. I love all these looks, including the alleged age inappropriate one. And I vote keep the shoes. You have great taste. I think the chocolate brown totally works! Tonight at choir practice there was a stylish woman about 20 years your senior totally rocking the short shorts! As you will be in 20 years. I would keep the Okalas - I think the style and color work well. And you're gorgeous in every look. Your natural golden tones are just so beautiful.And those legs! Jeez. Denise your RO pieces are outstanding. You chose so well with that tone. I do like the brown Okala's with these pieces. I am not a fan of brown generally but the colour is perfect and I like the modern but ladylike vibe of the shoe. Other outfits look fab and there is nothing age inappropriate about your outfit;). Denise, they are all great. I really like the shape of the skirt in the first outfit and it works well with the shoes. The second outfit is fab and the third outfit looks totally appropriate to my eye. You have gorgeous legs so why not show them off a bit. Those shorts are not too short at all. Thumbs up on the Oakalas. Ooooh I love the Sam Edelman sandals too! Great outfit both ways! Funny about the $13 win on sandals. Isn't it funny how that works? I have a workhorse tshirt that cost me even less a few years ago and am having the hardest time replicating it. You are looking fantastic all around, Denise. Love your style. I'm sorry it took so long to respond, after posting and running. This afternoon is the first time I've had a breather. Thank you for all of the kind words. Especially about not feeling self-conscious about the shorts. I live in the most let-it-all-hang-out place. It's 98 today (37 C) so no one blinks at trying to keep cool. But I do wonder if my YLF environment judges differently. Maybe it's good Angie is on vacation! I'm leaning towards keeping the Okalas. These are my first Okalas -- can you believe it -- they are so comfortable, for a heel. I was worried that without a heel cup, they wouldn't fit right but they stay on my feet. Sharan thank you for the suggestion of looking for stone footwear. I'm also on the hunt for tops that go with my Rick Owens pieces. I checked out the Collection (it is the Vicious Collection S/S 2014) and he tends to show his pieces as a column of color. And sometimes with other neutrals like off white and black. The fashion show with the step dancers is fantastic, here's the video. You always look age appropriate. I love all of these outfits! Love the Okala's. There is no reason you should feel self conscious in the shorts. They look wonderful. I like the RO outfit you wore and think the Okalas will work out well for you. Jeans outfit look great too! Keep everything and keep it up!